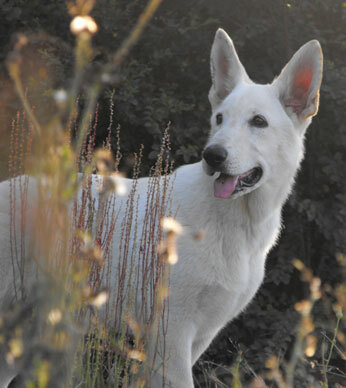 This is my 4 1/2 month old AKC White German Shepherd, Annie's Lillyanna of the Valley. She is super smart and a fast learner. By 4 months old we had taught her 5 tricks. She now does them all on command, sit,shake,high five, and roll over. We are currently teaching her stay and fetch. She has a very high drive, and loves to play. She also has a very sweet and loving personality, and she is always eager to please. Hope to compete in an agility event with her someday, since we can't show her due to her white color.